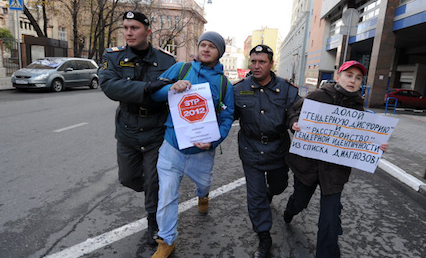 URGENT Defend the voices of Russia’s LGBT citizens now! On Wednesday, political leaders in St. Petersburg are voting on a new law that will make it illegal to speak in public about being gay, lesbian or transgender. Think about the implications of that for a moment. Thinking about how you would feel if your sexuality meant you lost your right to a voice. A broad coalition in Russia are doing everything they can to stop the bill. Suunday they organized one of the biggest demonstrations ever in support of equality – but still the international community is not paying attention. They need support from around the world – and they need it fast. Because Russia is powerful, most world leaders have stayed silent. But if we raise our voices now, we’ll shine an international spotlight on the issue that will be impossible to ignore. Please take 2 minutes to add your voice to All Out’s urgent call? They’ll deliver the petition to Russian embassies around the world and push the issue to the top of the international agenda. Sign here – 50,000 signatures needed – we can make our voice heard! If the law passes this week in St. Petersburg, it could quickly lead to a crushing of freedoms throughout all of Russia. Moscow, the largest city in the country, already said they were looking into passing the same law – paving the way for officials to make it national. Our friends in Russia believe that stopping the bill in St. Petersburg can derail the plan to take this law nationwide. Many around the world have been reluctant to criticize the ruling party led by President Medvedev and Prime Minister Putin, but their party appointed both the mayors of Moscow and St. Petersburg and they’ve gone on record in support of the proposed laws. Russia is already a dangerous place to be out and open as an lesbian, gay, bi or trans (LGBT) person. Courageous pride marchers were brutally attacked and detained by Moscow police last summer – for the simple act of holding their heads up high in public. If this bill passes, even the small victories that the LGBT movement in Russia has won will be wiped out – and pride marches, cultural festivals, and even the distribution of leaflets in the streets will be considered illegal.